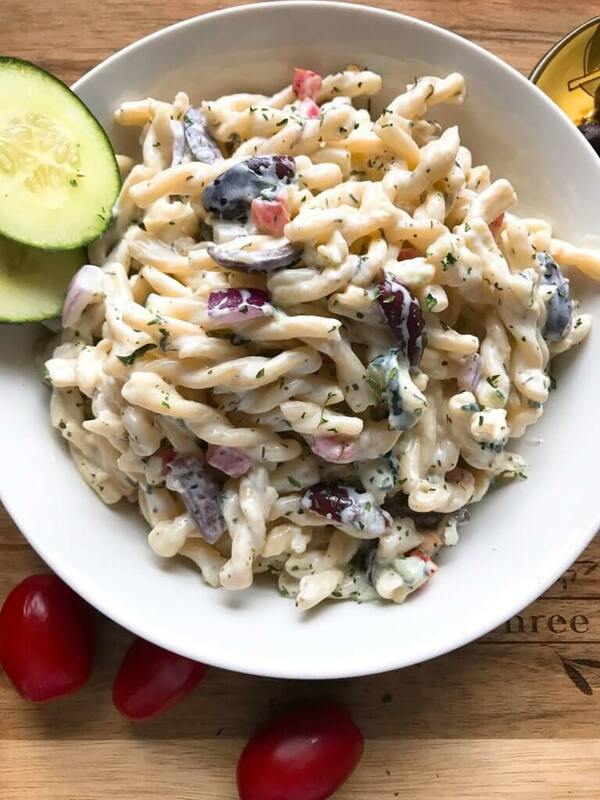 This simple Creamy Greek Tzatziki Pasta Salad is a great side dish option for your BBQ with a healthier spin. 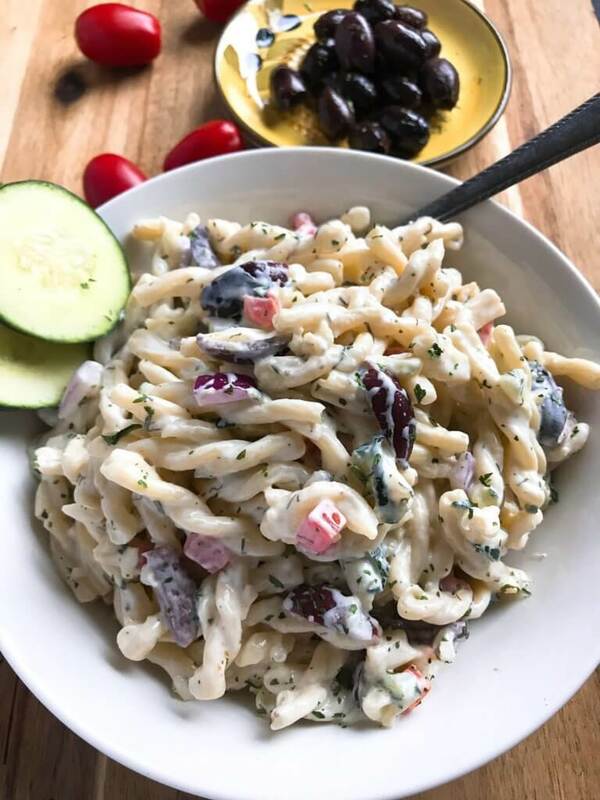 This Creamy Greek Tzatziki Pasta Salad is made with the same flavors of our amazing Greek tzatziki yogurt sauce (which I love to put on everything like these Oregano Lemon Yogurt Greek Chicken Skewers. 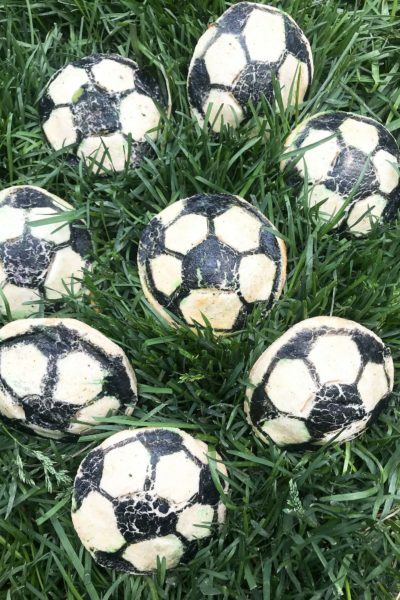 Yum.). The basics of tzatziki is plain Greek yogurt mixed with lemon, cucumber, dill, and garlic and it is just SO GOOD! 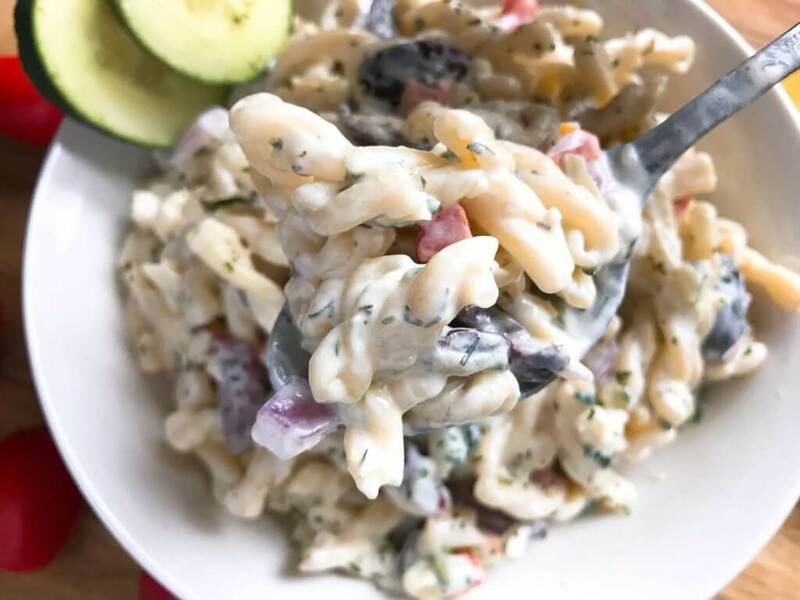 I made this Creamy Greek Tzatziki Pasta Salad with a healthy spin by using plain Greek yogurt instead of sour cream or mayonnaise. I am NOT a yogurt person, but in recipes like this you cannot tell! You still get the same creamy effect but the seasonings and flavors you mix in cover up any yogurt flavor. 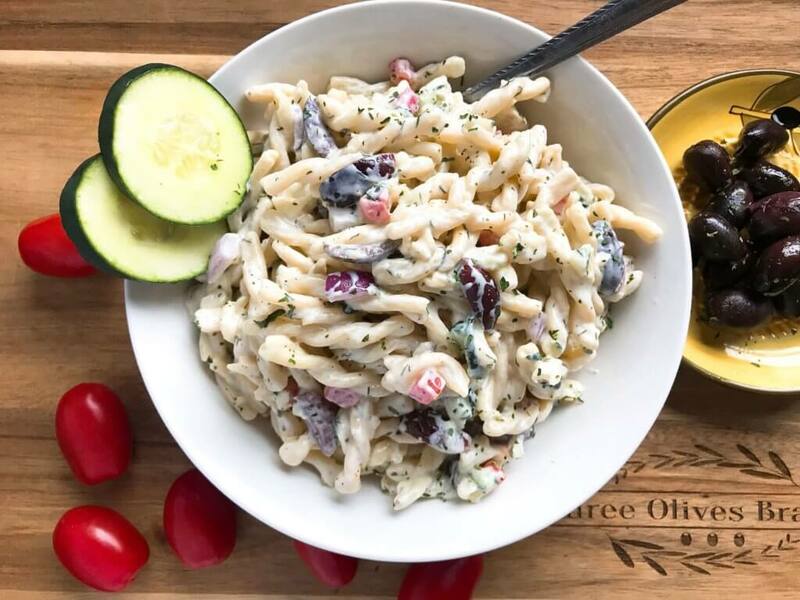 It is a great way to put a healthier spin on a pasta salad. Not being a yogurt fan, I was always skeptical of tzatziki as well. But it is AMAZING! The flavors of cucumber and lemon really shine through and I now find myself making tzatziki on a regular basis. 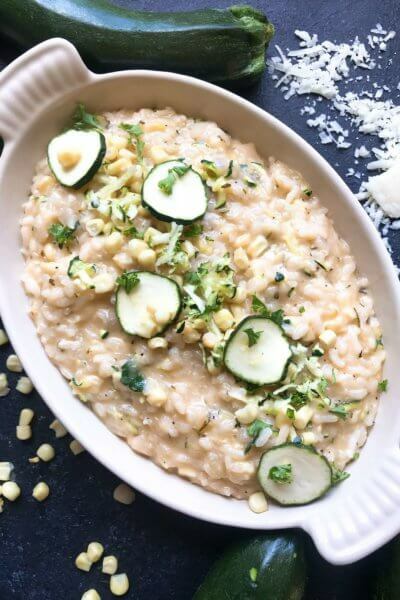 Even some of our friends that also have a yogurt aversion are in love with it as a dip when they come over for dinner. 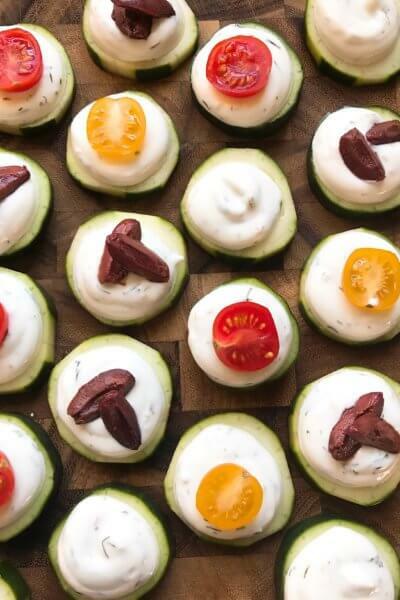 Find our collection of tzatziki inspired recipes here! 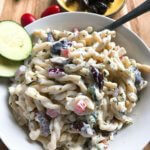 To make the Creamy Greek Tzatziki Pasta Salad, cook the pasta as per package directions until al dente (not too soft). Let it cool in a tupperware. Make the tzatziki sauce and get all of the mix ins chopped. You can use any tzatziki sauce you like, but here is our Greek tzatziki yogurt sauce recipe. When you are ready to serve, mix it all together. 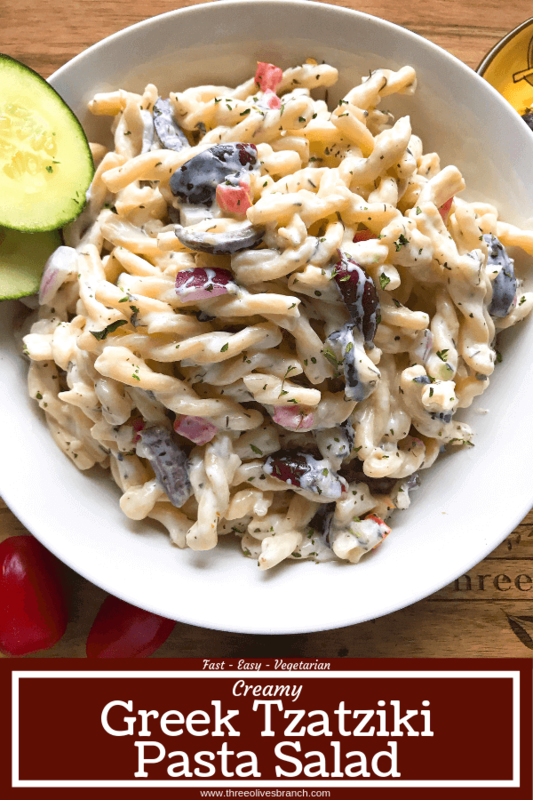 This pasta salad is easy to make in advance, perfect for a grilling party! Cook the pasta as per package directions in salted water until al dente (not too soft, still with some bite to it). Cool the pasta in a container. Make the tzatziki if not done already. Chill until ready to assemble. Chop all of your mix-ins (tomatoes, cucumber, olives, onion). 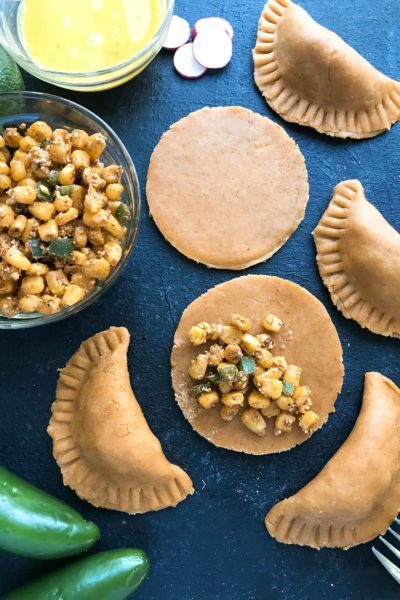 These can be added to the pasta container or kept separate. When ready to serve, mix the pasta, mix-ins, and tzatziki sauce together. Adjust seasoning and ratio as desired. Serve chilled. 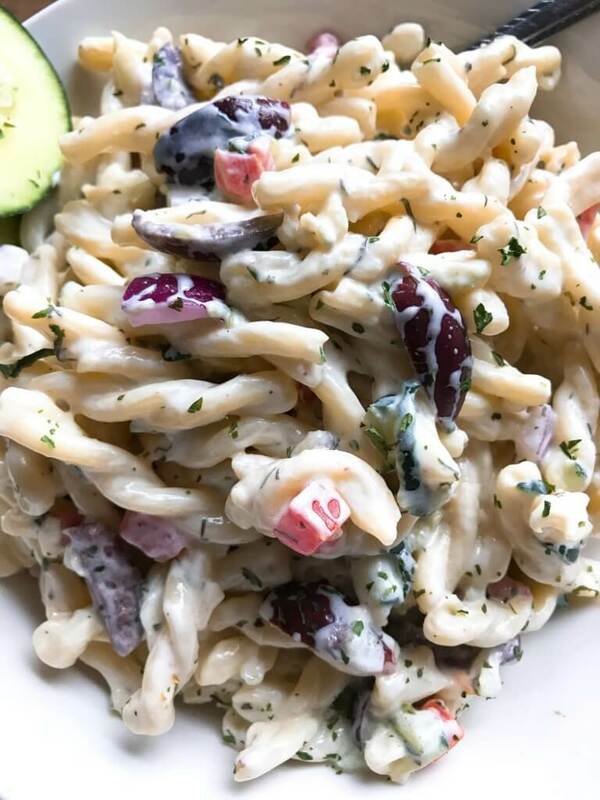 This pasta salad can easily be made in advance. It is best to keep the sauce separate from the pasta until ready to serve as the pasta will absorb a lot of the moisture in the sauce. Use as much or little of each mix in as preferred, and use more or less tzatziki to get your desired creamy consistency. Get our recipe for tzatziki here! 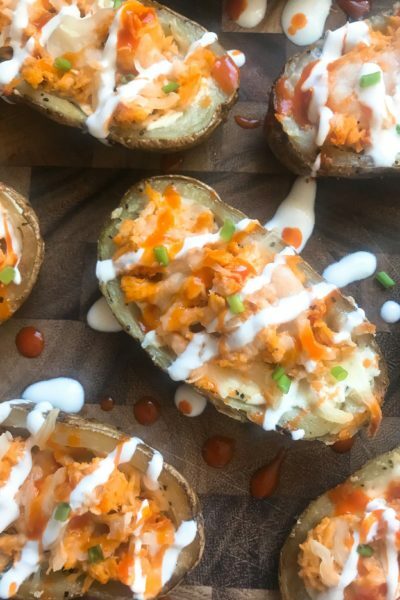 This recipe uses approximately 1/2 batch of the tzatziki sauce.